Dr. L. M. Darlong is one of the handful surgeons in India, dedicated to the care of non – cardiac thoracic chest diseases, besides repair of pectus deformity using modified nuss he also focuses on cancer surgery of the lungs, trachea, chest wall, oesophagus,and mediastinum. He emphasises on minimally invasive chest surgery using VATS and Robotic surgery. 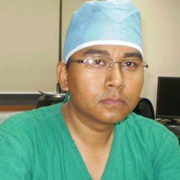 Dr. Darlong earned his Medical Degree from Gandhi Medical College, Bhopal and MS from AIIMS,New Delhi, He completed his Residency in Thoracic Surgery from AIIMS Delhi. He earned his Fellowship in Thoracic Surgery from Korea University Medical Centre Anam hospital, South Korea. He is a certified Davinci console robotic surgeon from Atlanta,US. Dr. Darlong pioneered advanced NUSS procedure for pectus deformity in India and is the first in the country to perform advanced NUSS procedure using technique of pectoscopy, crane lift and he innovated the pectus tunneloscopy and moon bridge fixation technique. Dr. Darlong is a diligent medical scholar with publications in various indexed journals and is also a reviewer in various national and international journals of repute. He is presently working as Head of Thoracic Oncosurgery at Rajiv Gandhi Cancer Institute & Research centre, Rohini, Delhi, India.